If you've been following my blog, you'll know that I passed a Google Cloud Professional Architect exam in March. I wrote a few blog posts about how I prepared it, and you may find it all here. I think Google Cloud is a sleeping giant, and I wanted to be among the first certified experts. AWS has much more services. For a professional level exam you don't just need to know some of them in depth, you need to know ALL of them in depth, in order to make the right architecture that fits the customers requirements. Linux Academy has amazing hands-on courses for both Associate and Professional level. In my experience - the only one that really prepare you for this exam. Work experience. This is where it gets tricky… AWS has a wide service catalogue, and your work environment hands is unlikely to cover the entire blueprint. To pass the associate level exam, you need to know what each service does. The questions are straight forward, if you know what the service does - you'll eliminate most of the options in your test, and get the right answer. AWS SAP (Solutions Architect Professional) is a real world business problem oriented exam. It's understood that you know all the AWS Service Catalogue in depth, and you are tasked with getting the most optimal architecture based on the customer requirements. You will get 77 different business scenarios (this is a LOT of text, so be prepared), and each one has 4-5 possible answers, which are all correct, you just need to figure out which one is the best for that particular scenario. In Associate level, you will go with VPN IPSec, cause Direct Connect is more expensive. In Professional level you'll have to go deeper, and it's likely that mapping the use case with the architecture, Direct Connect could come out as the most cost efficient option. GCP exam is very, very difficult. I feel like it's a Cloud Architect and DevOps merged into one exam, which makes it quite complex and "uncomfortable" at moments. BUT - GCP doesn’t have nearly as many services as AWS does in the Service Catalogue, so I guess the blueprint is narrower, which kind of justifies the complexity of the exam. 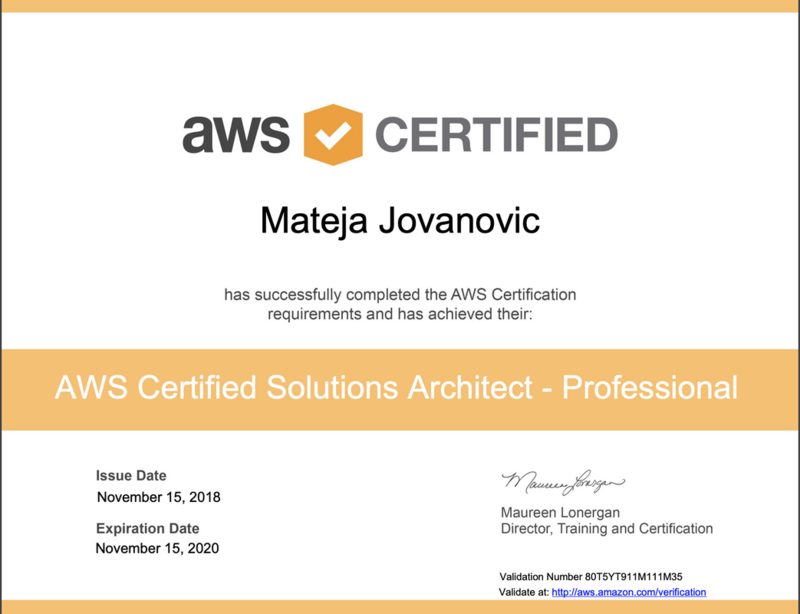 AWS is difficult, and long, requires high concentration during the 170 minutes, and probably what I like more - tests you for the real world skills. You will potentially get the same possible architectures as the answers in many different questions, and I feel it's impossible for someone to pass it even if they knew the questions, you really need an architect mind. On the positive side - there are no trick questions, so if you're good - you'll pass, it's as simple as that. I'm going all in for my VMware VCDX (Design Expert) exam now. Did the design, going for the defence. I think I'm in the point in my career to go for something like this, get roasted for thinking I'm a super architect… Bring it on, my ego is about to be destroyed, but I feel like I'll come out of the experience as a true business architect.